Managing a successful HVAC service company requires years of training, the right team, and the correct industry tools to provide both excellent customer service and competitive prices. Pairing your business’ operations with HVAC software can give your team the advantage it needs to schedule more jobs and win more bids. Our complete HVAC management software solution allows you to stay informed and connected with your team, get repair technicians to assignments faster, and close out completed work orders with greater ease. Does chaos overrule your HVAC service operations? Do clutter and bulky filing cabinets pose a threat to your productivity? Take back control of your company with HVAC business management software. With Smart Service and iFleet, our HVAC mobile app, you can eliminate disorder and consolidate your day-to-day dispatch, routing, service, and billing processes into one simple solution. Say goodbye to the days of double data entry, unnecessary phone calls, and disorganization. Empower your team to schedule and dispatch jobs faster and complete those jobs with streamlined communication and digital work orders. As your company grows, Smart Service will grow with it, allowing you to keep pace and take on more work with ease. Keep job information clear and accessible with digital customer records. New work orders pull in existing customer information. Technicians can record notes out in the field that get stored in your customer database. Don’t send your technicians into the dark when you send them to service an existing customer. 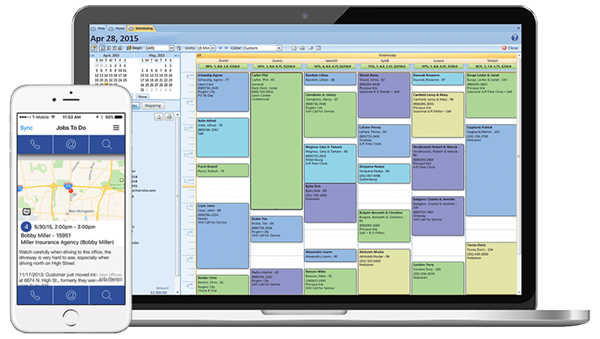 Smart Service HVAC business management software pulls job history and notes into the work order, providing your technicians with valuable information. Send schedule updates and work order information out to your team immediately with HVAC business management software. No more phone tag. Don’t force your team to wait on each other to get their jobs done! Do you dread the phone call from customers asking where the technician is and when they will arrive? With iFleet, your technicians will get GPS directions to jobs and you will see their location in real-time while they work out in the field. Don’t miss out on profits. Don’t upset customers with invoice errors. With digital work orders, everyone will remain on the same page when it comes to the work completed. Smart Service will also create a ready-to-bill invoice right in QuickBooks! When selecting an HVAC business software solution, you not only have to consider the features of HVAC software, you also have to consider total expenses over time. Smart Service allows HVAC companies the opportunity to own their software and pay an up front purchase fee. Most outside software providers pile up monthly subscription and user fees, especially as businesses grow. With Smart Service, your HVAC business management software pays for itself! Don’t get wrangled into spending more for software as your company expands and grows. Still not convinced that management software for your HVAC business makes sense? Smart Service and iFleet can streamline your HVAC business operations and maximize productivity and scheduling.